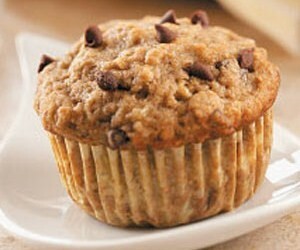 Soft and moist spiced muffins loaded with bananas, walnuts and chocolate chips. Here is an easy dessert recipe for Banana Walnut Chocolate Chip Muffins. Preheat oven to 350°F (175°C). Lightly grease and flour a 12-cup muffin tin or line with paper liners. Combine flour, buttermilk powder, baking powder, salt, cinnamon, nutmeg and baking soda in a medium bowl; make a well in the center. In separate bowl, cream butter, oil and sugars. Add eggs, beating thoroughly. Mix in banana and milk. Pour mixture into well. Mix batter until just moistened; do not over mix. Gently fold in walnuts and chocolate chips. Spoon mixture into prepared muffin tins until two-thirds full. Bake for 18 to 20 minutes or until tester inserted in the center of muffins comes out clean. Cool in pan on wire rack.